What a fast-moving, productive and legendary summer! As we continue to emerge from a very difficult market, out team sees new opportunities to change our Stars. We are seizing these opportunities to not just move the bar, but to raise it and knock the top off the lid with a new standard of excellence. So what does it mean to provide legendary service? It means we know our business. We study, learn and become educated beyond the minimum; we become experts in our market and provide more knowledge and information because we are professionals. It means that we use today’s technology so we can communicate with our clients the way they prefer to be communicated with. It means we use the most skilled personnel whether it is in home preparation and showmanship, photography, videography, editing, search engine optimization, social media, accuracy of data input, selling, negotiating, or coordinating the closing process. It means doing the right thing – every time, in every situation, regardless of the personal consequences. When we serve honestly and ethically, everyone benefits: our clients, other agents, the public at large, other industry specialists and our families. A current example of productive service is the Quick-Turn-Around chart below. 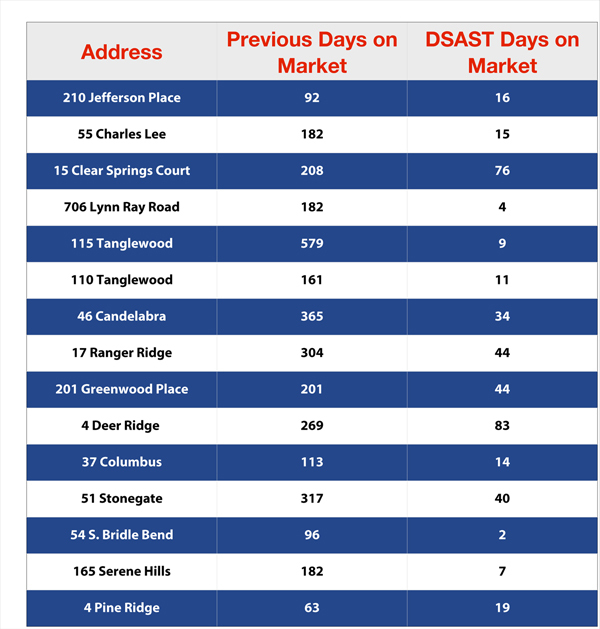 These are some of our recent property sales where the home was listed with another local Realtor prior to our listing. Most of these sellers wrote to express their appreciation. Support staff members, Jennifer Beightol and Andrew Bird, have become licensed Realtors adding more flexible services to our clients. All Star Access is now live! This is an online system which will allow our buying and selling clients 24/7 access to listing status, documents and communication with our Team! Wendy Gay, Buyer Specialist, was an honored hostess at the home of her new home buyer, Brett Montague. The occasion was a delightful house warming party for his friends. Father Godfrey provided a special prayer and blessing for the home. Team’s Most Successful Open House ever was held August 4th at 219 and 223 West Canebrake. Sixteen families enjoyed a tour. The event generated a successful offer on 219 West Canebrake as well as other interested buyer prospects. More news, but on a personal level. Our family has wedding bells ringing on September 20th in a beautiful private garden in Columbus for Grandson Andrew Lewis and his model bride, Kinsey Byrd, of Long Beach. Both will be in graduation ceremonies at Mississippi State University on December 13th with Kinsey completing a master’s degree in Geo-engineering and Andrew a B. S. in Agri-economics. Our team meets every Monday morning to focus our hearts and minds on gratitude to God for the special blessing of serving you, to pray for focus and compassion to serve effectively and to pray for any of you that we know of with special needs. We thank you for these opportunities.